The container ship El Faro was hauling cars, groceries and other products needed for daily life in Puerto Rico when it met its demise during Hurricane Joaquin, per CNN. Now the National Transportation Safety Board is searching the wreckage in hopes of locating any clue into the ship’s last moments. 33 crew members on board the El Faro were lost when the ship went down as Hurricane Joaquin grew into a category 4 storm, making it one of the deadliest maritime accidents of the past 60 years. The NTSB’s best shot at investigating the events that led to the wreck is locating the ship’s “black box,” which records vital voyage data from the ship. While the ship was located on October 31, CNN reports that their initial search for the black box was unsuccessful. The NTSB has released this raw footage from their most recent search of the El Faro’s wreckage, where you can see cars and other items that came loose from the ship as well as just how deep in the sand the wreckage is buried. According to CNN, El Faro’s stern was buried in over 30 feet of sediment, and the bridge which houses the ship’s navigational systems was shorn completely off—indicating an incredibly violent end. Per NBC, the wreckage sits under 15,000 feet of water 36 nautical miles northeast of the Bahamas’ Crooked Island. 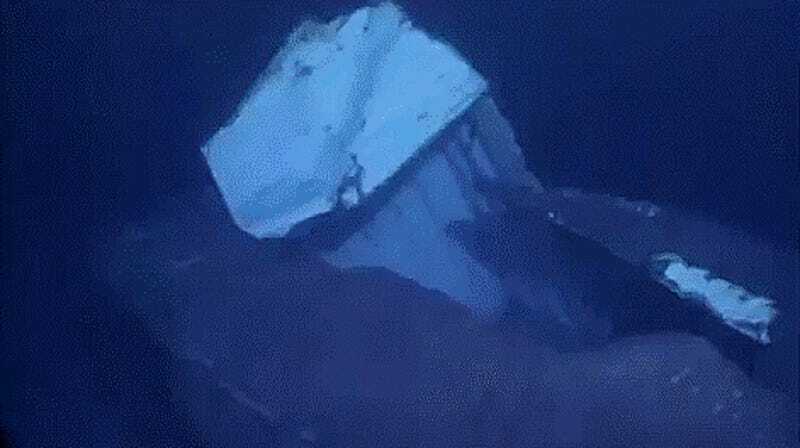 Additionally, the NTSB has released its accident docket on the El Faro with nine photos of the damage as well as a full 47 minutes of underwater video, but no investigative report. A lawsuit quoted by NBC and filed by one of the sailor’s families against the ship’s owners last year alleged that the ship “had a history of losing power while under voyage and during hurricanes.” Unfortunately, the one item that could likely tell if that happened during Hurricane Joaquin remains missing for now. Top gif sourced from AP video.